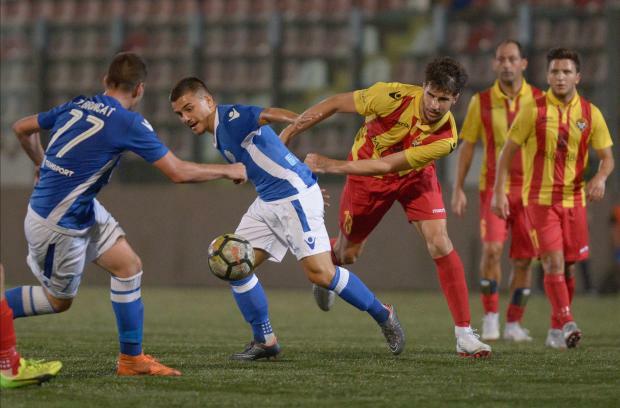 Mosta broke little sweat to see of Senglea Athletic by two clear goals to pick up their first league win of the season. It was a convincing performance from the Blues who had too much firepower for a poor Senglea side who suffered their second successive defeat. y.
Alessio De Cerchio broke the stalemate after eight minutes when he caught goalkeeper Philip Schranz out of position and he lobbed the ball over the Senglea goalkeeper. Senglea’s response soon arrived as a minute later they were awarded a central free-kick and Ferdinando Salvati’s inswinger came off the bar with goalkeeper Andreas Vella beaten. On 15 minutes, Tyrone Farrugia was at the end of De Marchio’s inswinger but his thumping header was blocked by Schranz. From then on, the match remained evenly balanced, with Mosta administering proceedings with Senglea trying to hit them with quick forays. Mosta doubled their lead on the stroke of half-time when the Senglea defence failed to deal with Renan’s cross and in came Massimo Sammartino who bundled the ball home from close in. Seven minutes into the second half, Hirose should have added a third goal for Mosta. The Japanese was well picked inside the area by Renan but he was denied by a fine reflex save from Schranz. Four minutes later, the woodwork denied Mosta as Misael Miranda Gomez saw his effort coming off the upright with Schranz beaten. Senglea finally threatened on 62 minutes when Leighton Grech sped into the area but his shot lacked power to unsettle Andreas Vella. The Cottonera side finished the match with ten men when Nour was shown a second yellow card and was dismissed. Mosta midfielder Kei Hiroshe was voted as the BOV Player of the Match.